The Federal Transit Administration has just issued a Record of Decision for the Purple Line, basically approving the 16-mile light rail line between Bethesda and New Carrollton. It's one of the last pieces needed to build the line, which is scheduled to break ground next year and open in 2020. This just got one stop closer to reality. Image from Montgomery County. Maryland Transit Administration officials made the announcement this morning during a Montgomery County Planning Board meeting about the Purple Line, which Purple Line NOW! and BethesdaNow subsequently tweeted. The FTA will make a formal announcement next week. The agency's decision means Maryland can start purchasing right-of-way to build the $2.37 billion Purple Line, and makes it eligible for federal funding. President Obama recently included it in his 2015 budget, which Congress will have to approve later this year. With state funding in place and an ongoing search for a private partner in the works, nearly all of the money needed has been secured. As a sign of how likely the Purple Line is to get built, the Planning Board is meeting today to make detailed recommendations about how it should interact with surrounding neighborhoods, like what materials to use for retaining walls. Meanwhile, Washington Post columnist Robert McCartney has a piece out today urging the affluent Town of Chevy Chase, which has been fighting the project for years and recently hired a congressman's brother to lobby on their behalf, to lay down their arms and use their money to make the project better instead. "Some people have more money than good judgment," he wrote. "The town should end its obstruction of a worthy project. Burning money is unwise even if you have it to spare." 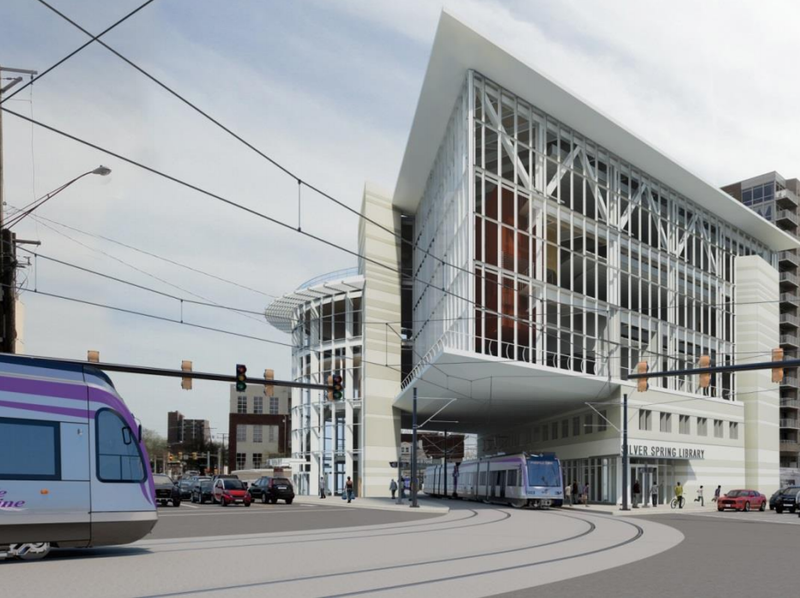 Great image of the Purple Line and the new Silver Spring Library. But just look at the size of the pedestrians in relation to the wide expanse of the intersection and imagine trying to get across it to the library safely in traffic with a big bag of books, with a toddler in tow, or if you are handicapped. Then think how much harder it will be in snowy weather like we've been having. The image clearly shows why the bridge to the parking garage across the street is needed.